Ide Yosuke Meijin no Jissen Mahjong (井出洋介名人の実戦麻雀, Ide Yosuke Meijin no Jissen Mahjong?) is a mahjong game developed and published by Capcom. It is the third of a trio of third party Mahjong games developed for the Nintendo Famicom within two months during 1987 including Mahjong Kazoku by Irem and Family Mahjong by Namco. Among the three, it is the most unique for two reasons. The first is that it ships with a unique controller explicitly designed for Mahjong games. 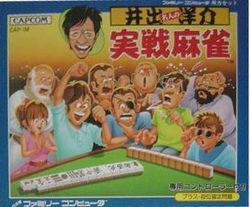 The second is that it does not play the traditional mahjong game, but rather a variation of the game known as "Reach Mahjong" or "Attack Mahjong". This page was last edited on 1 October 2010, at 20:20.